Perfect for anyone who spends time in the saddle, these boots were sent out to Horse Trainers, Western Shooting Competitors, and Pro Rough Stock Rodeo Cowboys for testing and feedback. The Results: Barstow "Horseman" Pro Riding Boots are top of their class for Comfort, Form and Function! The "Horseman" runs wider than our Barstow Arena Collection and Barstow Classic Collection Riding Boots, due to the wider toe. 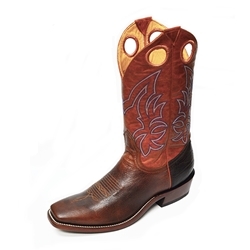 You will need to order anywhere from a Half Size to a Full Size smaller than your usual Barstow Riding Boot Size. Only available in Renegade/Mango Color Combination. Only Available in D Width.